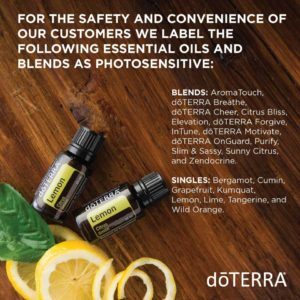 Photosensitivity and phototoxicity apply to topical use of essential oils only and do not pose the same risks when used internally. 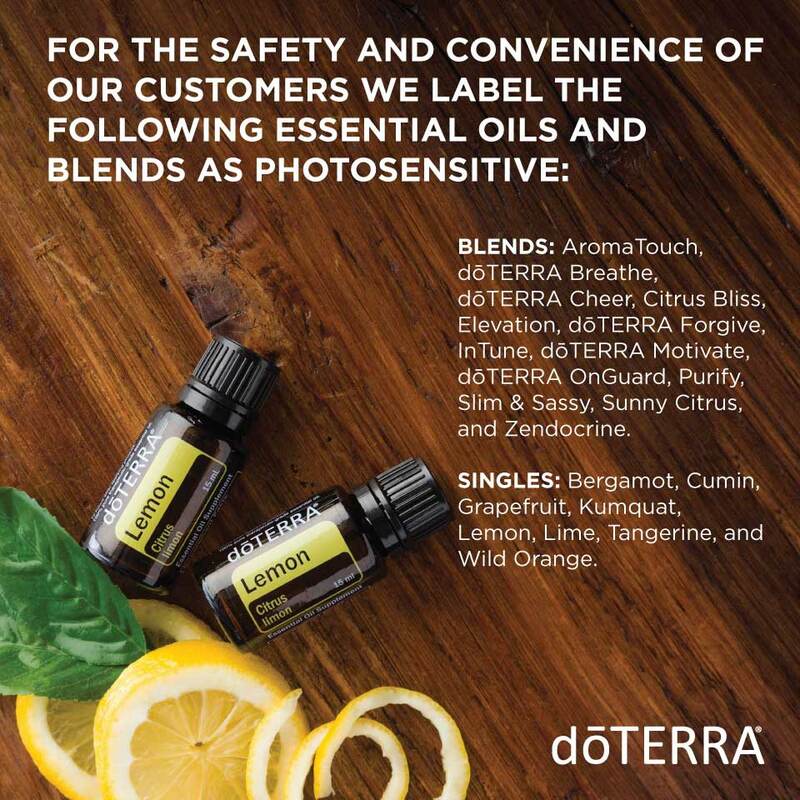 When using a photosensitive essential oil topically, avoidance of sunlight is recommended for up to 12 hours after use. Use caution with the citrus oils. The above list may not be all inclusive. Be sure and check labels and do your research on oil blends. Photosensitization is the process in which ultraviolet (UV) radiation combines with a particular substance and causes chemical or biological changes. Some essential oils contain furocoumarins, a special class of constituent that can cause photosensitization of the skin. The most commonly found furocoumarins in essential oils are bergapten and oxypeucedanin. The chemical structure of these molecules (and their metabolites) allows them to form cross-links with skin cell DNA, in turn making the skin especially susceptible to UV radiation. During the process, free radicals and singlet oxygen are also formed and can inflict damage on cellular membranes, organelles, and proteins. If exposed to sunlight (which gives off UV radiation) after topical application of a photosensitive oil, the skin may become temporarily darkly pigmented, red, or irritated.